There are not a lot of places Ryan and I will drive 3 hours round-trip for when it comes to a bite to eat. Actually, there’s really only one — Palmer’s Village Cafe in St. Simon’s Island, Georgia. Also – because we just celebrated our 3rd anniversary – I’m reminiscing on our trip back to the land of peaches & cotton for one of our favorite spots to eat. I’m talking that HANDS DOWN this is the best place to eat breakfast. And I eat A LOT of breakfast. Fresh caught seafood, farm fresh eggs, fresh sawmill gravy and a gourmet spin where even the sauces are homemade? Oh AND you can eat there for about $15 a person? Yup. It’s that place. It’s fresher than the Fresh Prince. 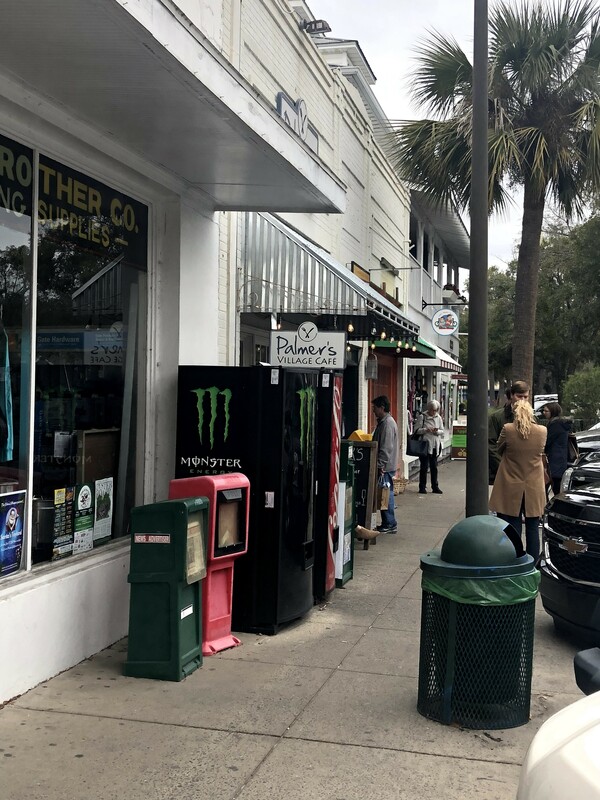 Now St. Simons….HMMMM that may sound familiar, right? Yes. We tied the knot there New Year’s Eve 2015! It was a great time, and we had only been up there 2 times prior to the big day. No emotional attachment before the wedding, but when somewhere is pinterest-perfect, well you find out why! 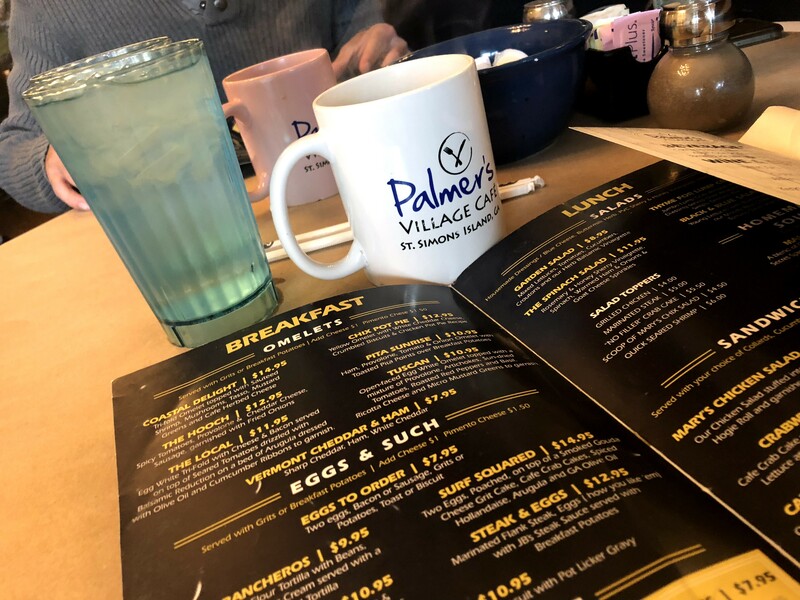 Each time we made the trip, every breakfast was eaten at Palmer’s. That week – we were regulars, and good thing cause ya know you need comfort food when it’s wedding planning time. 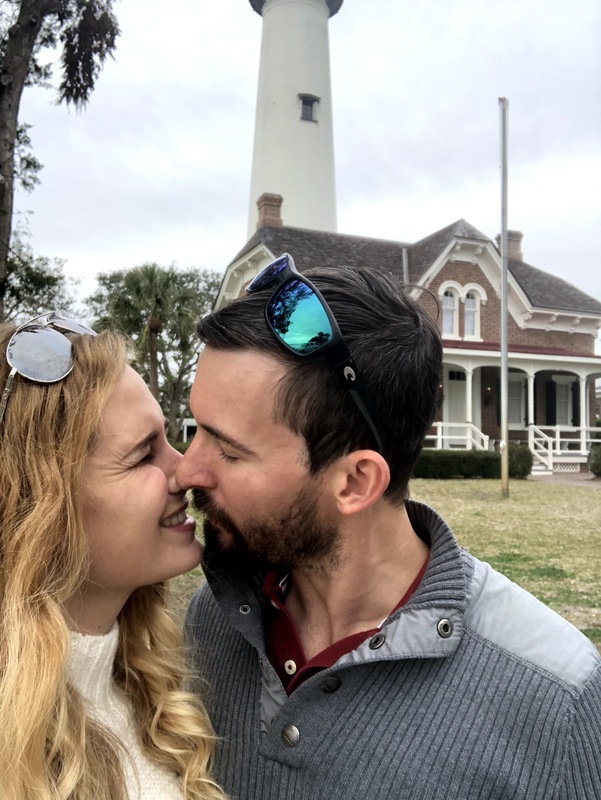 When people ask us about the wedding weekend (I mean not many people have it at a lighthouse!) we tell them – no matter what when you go to St. Simon’s, you have to go to Palmer’s. The St. Simon’s Island Lighthouse – where we celebrated our wedding New Year’s Eve, 2015. Fast forward 2 years to our most recent anniversary, and the wandering souls we are we found ourselves with a cancelled road trip, ski trip, NYC trip (it was seriously getting funny the slew of bad luck we were finding) we found ourselves in Jacksonville, FL for a surprise birthday party – only 60 miles away from St. Simon’s. With no anniversary plans to speak of, we figured we’d grab a brunch. Now – where to go? Palmer’s immediately popped in my mind. After all, with 10 hours in the car to make a birthday party, what was another 3 hours of driving anyway? Now, Palmer’s is the kind of place where they take care of their employees. There, you’re family. Palmer himself works with the staff and fills coffee, checks you out diner-style and greets people at the door. So, after a quick call to the restaurant to make sure they hadn’t taken the holiday off, we were on the road! And it was exactly how we had left it. It was like we were exactly where we were meant to be. 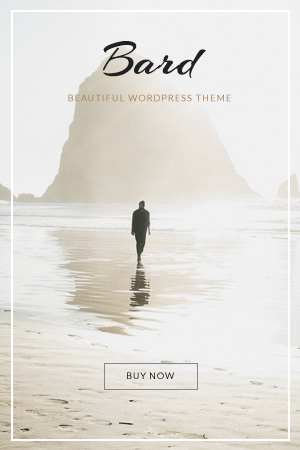 The atmosphere of Palmers – now that’s I think what makes it truly unique. It reminds me of the donut shop I used to go to with my Dad on a Saturday morning, just comforting. The experience is intimate, causal, but the food – it’s OUT OF THIS WORLD. Being in Georgia, they have some standards for food – and boy do they reach them! Even the steak sauce is homemade! Other standouts? The pimento cheese, tasso (that’s special homemade ham), tomato jam, and my personal favorite – the sawmill biscuits and gravy. It’s the “sawmill” that makes it extra special, cooked from their special meat drippings it’s got a little tang that I’ve never tasted anything quite like it. Order it as a side – and wear your eating pants because you’ll still want a main dish. 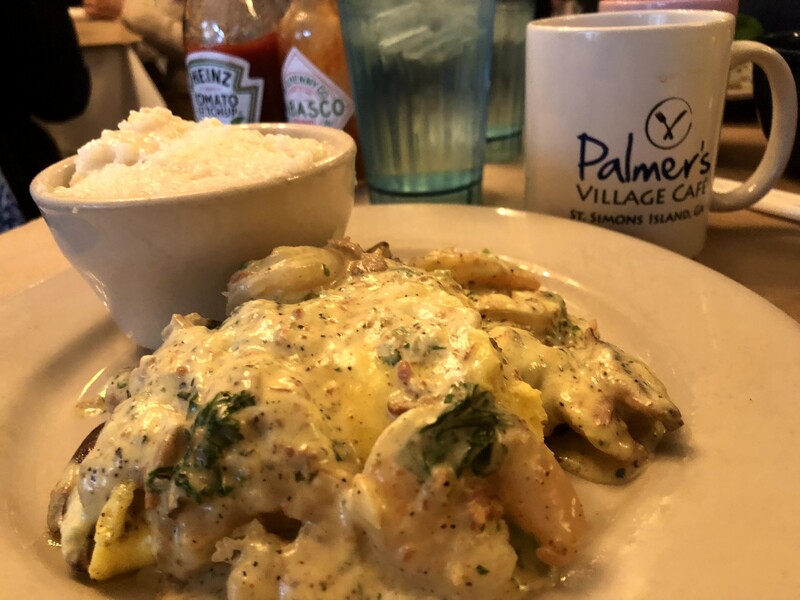 My go-to, the “Coastal Delight Omelette” – it’s 3 farm-fresh eggs, homemade tasso (ham), fresh caught shrimp, mustard greens and a homemade herbed cheese sauce. And if you wanna keep it southern – get the grits, with the pimento cheese. This place is just magical – and I seriously could (and kind of already have) go on for days. But the last thing I’ll say, is that Palmer’s cares, because Palmer cares. As a girl with crazy food allergies, I can attest – these people know their food, and you can taste the heart and love that goes in it and has you begging for more. So, when you take your trip, say hi to Palmer for me – and you’ll have a taste of home at this special spot.